Spray 5-quart slow cooker with cooking spray. Pour whipping cream into slow cooker; stir in 2 teaspoons salt. Peel potatoes, then cut into 3/4-inch cubes. Add potatoes to cream while cutting to prevent browning. Be sure to submerge potatoes in cream. Add enough water to cover potatoes, about a cup. Cover; cook on High heat setting 6 hours to 6 hours 30 minutes or until potatoes are very tender and can be mashed easily by pressing against side of cooker with spatula. Mash, crush or smash potatoes using potato masher, or beat with electric mixer on low speed until well blended. Do not overmix. Cover; keep warm on Warm heat setting until serving time, up to 2 hours. Stir before serving. 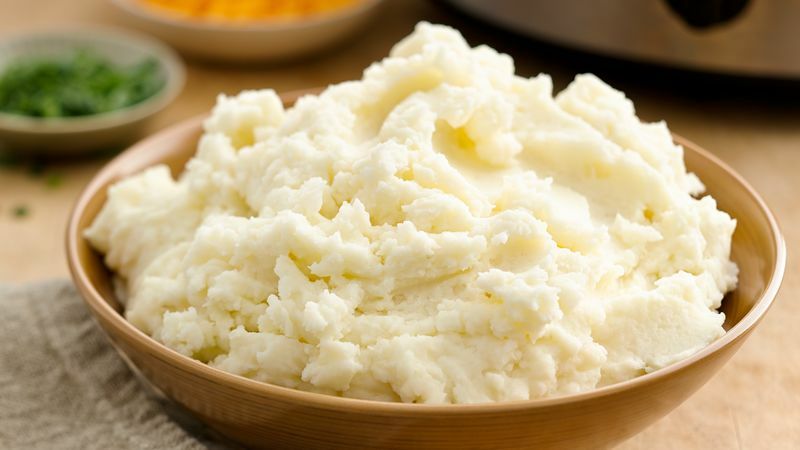 A fun-filled mashed potato bar is well within reach with these easy slow-cooker beauties as the base. Just keep the cooker on Warm, and set out bowls or martini glasses for serving. Then set out toppings from easy (butter and shredded cheese) to decadent (caramelized onions, cooked bacon, sliced steak). These potatoes were designed to be dressed up however you like, but they're equally delicious served plain. If you're not topping with gravy, cheese, bacon or other salty toppings, you may want to add a little more salt (1/2 teaspoon or so) to the potato mixture at the beginning.